Bob Dylan’s relationship to the political world and the matters he chooses to champion or protest have been the subject of much debate, discussion, and inspiration for over 50 years now. His arrival in Greenwich Village in 1961, to a scene informed as equally by poetry and politics as it was jazz and folk, marked the beginning of his relationship with topical song, followed by a famous retreat from it, as well as his resistance to the tag, “voice of a generation.” And yet, as the ‘70s began, Dylan was once again plucking his subject matter from the news, returning to his roots as a social justice singer with “George Jackson”, a memorial for the radicalized convict and Black Panther who died in a San Quentin prison shoot-out on August 21, 1971. Against a backdrop of escalating war in Vietnam and social and political mayhem to accompany it at home, by the late ’60s and early ’70s, the climate made necessary topical rock and soul songs which documented the times. John Lennon put forth “Imagine”, the follow-up to his and Yoko Ono’s initial bursts of song devoted to giving peace a chance. Marvin Gaye voiced his concerns in “Inner City Blues (Makes Me Wanna Holler)”, “What’s Going On?”, and “Mercy, Mercy Me (The Ecology)”, while Cat Stevens boarded the “Peace Train” that would ultimately take him to study the Qur’an and inspire a conversion to Islam. It was also more or less expected that in these times of trouble, serious artists would weigh in on the events with a song. From the chart-busting Motown artists who began to draw from a repertoire that was blacker and stronger, to the rush-released recording by Crosby, Stills, Nash and Young of “Ohio” concerning the shooting tragedy at Kent State, the appetite for topical songs in the US was fuelled by chart successes. Bob Dylan’s early ‘60s pro-civil rights and anti-war songs were largely the catalyst for the strain of rock music with a message that thrived throughout the decade. And while it’s true that from 1966 through much of 1971 Dylan remained in self-imposed exile from touring, leaning more towards poetical and philosophical lyric forms, rather than those polemical or topical, “George Jackson” was his wildly unexpected return form.Performing in public for the first time since his Isle of Wight concert in 1969, Dylan appeared at Madison Square Garden on August 1st at the Concert for Bangladesh, the model for today’s all-star rock charity events. Organized by George Harrison and Ravi Shankar, the rally for Bangladesh raised awareness and funds for the residents of East Pakistan and Bengal India, regions beset by complications of war plus a cyclone and the flooding and famine that followed. An already troubled region was now devastated, and as Shankar outlined the situation for concert-goers, Dylan helped to draw them, performing “A Hard Rain’s A-Gonna Fall”, as well as a handful of more apolitical songs. Later that month at San Quentin in the summer of 1971, George Jackson was shot to death during an alleged escape attempt following a prison riot in which five inmates and a guard were killed. Less than a month after the Jackson incident in California, a historic event at Attica Correctional Facility wherein prisoners took control of the prison to protest its poor conditions resulted in more fatalities—an unmistakable call for prison reform. 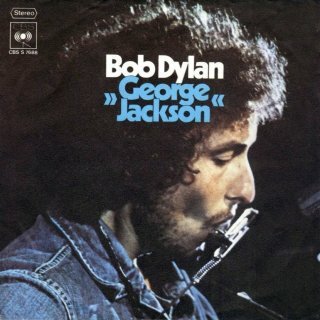 Perhaps it was the call to which Dylan was responding when in November, he cut and released “George Jackson”, a 45-rpm record that reached the Top 40 in January of 1972. Opening with the blues trope, “I woke up this morning,” Dylan’s “George Jackson” is not a typical blues song, though it surely addresses the larger topic of racial and socio-economic oppression from which a certain style of blues was born. It also tells the story of Jackson. Having made it to California from the streets of Chicago, a 70-dollar robbery landed Jackson in prison, his sentence indeterminate. He found trouble on the inside when guards took an immediate dislike to him; his sentences were extended—chiefly behind events occurring at Soledad State Prison in which three black inmates and a white guard were killed. Using his time in solitary to educate himself, he studied psychologist Franz Fanon (The Wretched of the Earth), Marx, and Mao, and came to understand the incarceration of poor Blacks for petty crimes in a political context. A leader in moving prisoners to radicalize, Jackson joined the Black Panthers and became one of the group’s most celebrated members. However by 1969, J. Edgar Hoover—declaring the Black Panthers to be public enemy number one—had set out to decimate them, and other groups like them. Nevertheless, Soledad Brother: The Prison Letters of George Jackson was published in 1971 and was greeted by a positive reception by intellectuals and political progressives. That Jackson had been framed for conspiring to kill a guard in the Soledad incident was a widely held belief; his defenders were vocal and his case was a cause celebre. But a few days before his trial was to begin, a riot broke out in San Quentin in which inmates and guards were again slain; this time it was Jackson who was shot while running across the yard in an alleged escape attempt. The details of the George Jackson case are still debated today by scholars, historians, and those who remember the events. Just this month, the last incarcerated member of the San Quention Six, Hugo Pinell, was killed while serving his life sentence, much of it in solitary confinement.